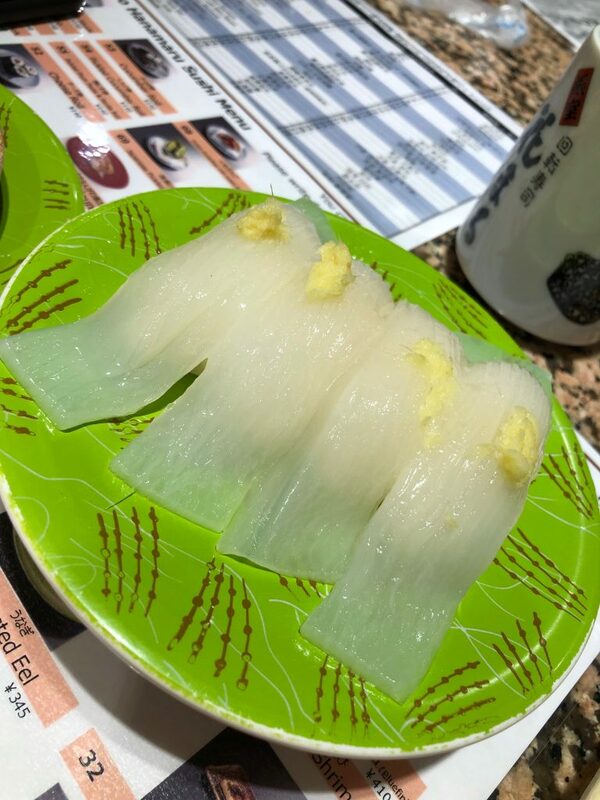 Kaiten (conveyor belt) sushi at Nemuro Hanamaru (回転寿司 根室花まる) is a good choice for a first meal in Tokyo, especially if you have limited facility with the language. It’s relatively easy to find, located as it is on the 5th floor of the Kitte Building, a beautiful triangular glass mall across from Tokyo Station. The major drawback to Nemuro Hanamaru is the wait. If you arrive at a peak time, like we did, you might find yourself in line for an hour or more. Luckily there are a lot of beautiful shops in Kitte to occupy your time – just make sure you’re back in line when your number is called. 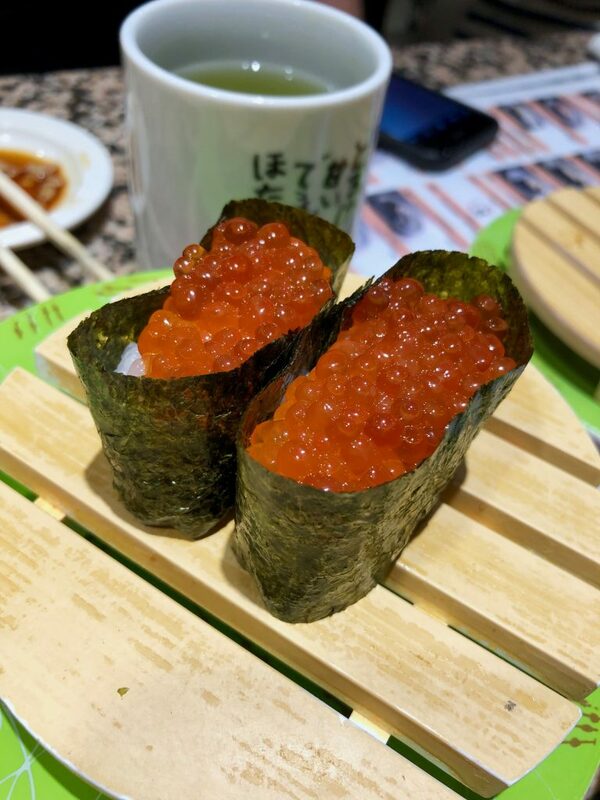 Unlike many cheaper kaiten sushi joints, Nemuro Hanamaru’s sushi is prepared by humans, not machines, using high quality, fresh fish, and results in a pretty good product. Eating here is a lot of fun, with a cheery, bright, convivial atmosphere that turned out to be perfect for three jet-lagged travelers. For the full experience it’s best to sit at the counter itself or in a counter-adjacent table if with a small group. Grab anything that looks good off the conveyor belt as it goes by. Plates are color-coded by price and at the end of the meal the waiter will total up your plates and charge accordingly, similarly to the small, medium, large and x-large pricing at a dimsum hall. 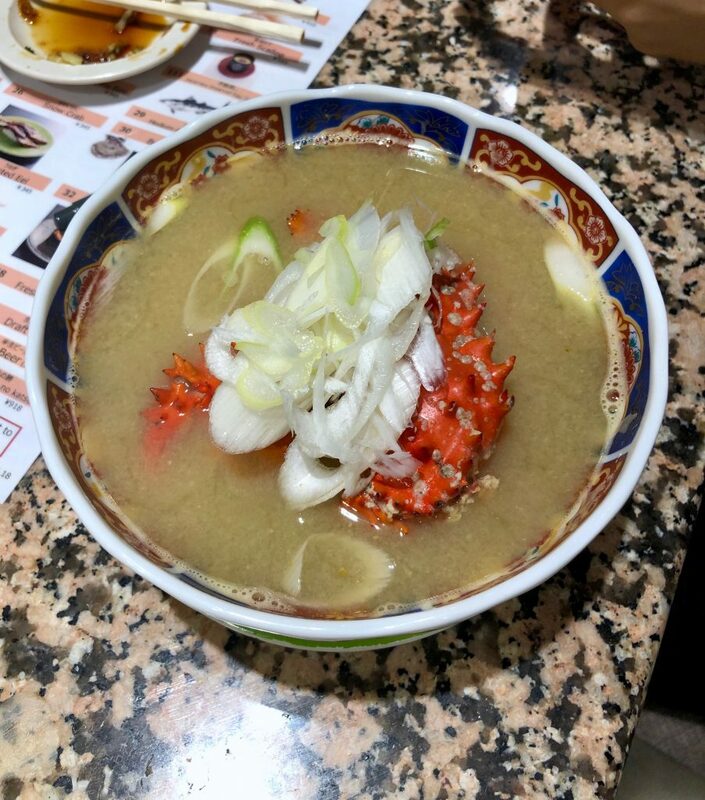 There’s an a la carte menu as well (English version available), but the only thing we ordered was a rich crab soup to share. 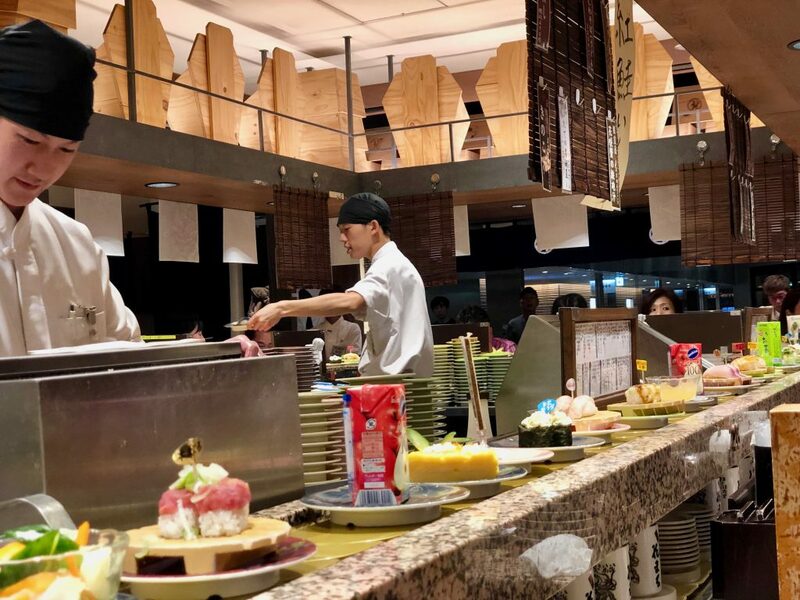 You can also shout out sushi orders to the waiters if you have a Japanese speaker amongst your group – a reason for doing this would be to get more pieces than a standard conveyor plate, which usually has two. Drinks are basic, consisting of boxed drinks on the conveyor belt, beer ordered from the a la carte menu, or free tea. Take a cup from the sub-conveyor and fill up from the tap at your table.